Recipe adapted slightly from [amazon_link id="1580089984" target="_blank" ]Peter Reinhart's Artisan Breads Every Day[/amazon_link]. Combine the flour and salt in a large bowl, as well as the dry instant yeast, if using, and stir to combine. If using fresh yeast, crumble into a small bowl and remove 2 tablespoons of the water and mix with the yeast until dissolved. Pour the yeast mixture back into the remaining water and combine with the olive oil and brown rice syrup. Mix to combine before pouring into the flour. Using a wooden spoon, or an electric mixer fitted with a paddle attachment, mix the dough for 1 minute, until well combined. Then leave to rest for 5 minutes to allow the flour to fully hydrate. Mix the dough again, for another minute. You will find the dough will still be very sticky, but should be a little less sticky than before. Grab a large bowl and lightly grease with olive oil and place the dough into the bowl. Cover with cling film and leave for 10 minutes. Wet your hands thoroughly, or cover in a light film of oil (I prefer to wet my hands as it's easier to clean up) and reach into the bowl and grab the middle of the underside of the dough. Pull the dough and stretch it out with your hands and fold the dough on to the top of the dough. Repeat with the opposite side, by spinning the bowl around, and each side, stretching and folding the dough a total of 4 times in total, once on each side. Repeat this process every 10 minutes for the next 30 minutes. After the final stretch and fold of the dough, cover with cling film and refrigerate overnight, or for up to 4 days. The next day you will notice the dough has risen substantially. To bake your first loaf, cut the dough in half, being careful not to remove all of the gas. On a lightly floured bench flatten the dough into a 5 inch by 8 inch rectangle, and working from the shorter side, roll up the length of the dough. Pinch the final seam together with your fingertips and gently rock the dough to even it out. Place the loaf in a greased pan, seam side down. Cover and leave for 3 hours, by which time the dough should have doubled in size. An hour before baking, prepare your oven. Adjust the shelves so that 1 shelf is on the bottom and adjust the second shelf to the next rung above the bottom shelf. If possible, set your oven so that the heat comes from the bottom element only, and preheat your oven by turning it up as high as it will go (my oven only reaches a maximum of 250 celsius so the baking time is for this temperature). Place a baking tray on the bottom shelf that is capable of holding 1 cup of water. When you're getting ready to bake, boil the kettle and when it's boiled place the bread in the oven, on the second bottom shelf, and pour 1 cup of boiling water into the tray below. Close the oven door and bake for 12 minutes. If you were unable to set your oven to cook from the bottom element you may need to cover the top of the bread with foil to prevent it from browning too much. Turn the loaf and bake for another 15 minutes before removing and cooling on a wire wrack. 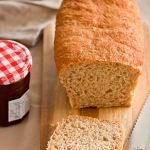 Don't cut the loaf until it's completely cooled as this will allow the crumb to set properly. The remaining dough can be baked any time over the next 4 days.